Welcome everyone to the May Tour de Freaks Blog Hop! This month we are all new catalog sneak peeks! With the new catalog launch right around the corner– here’s a great way to get some super ideas from the amazing Control Freak stampers! If you are going forward through the hop, you arrived here from Melissa Davies and her Rubberfunatics Blog! She has just such great ideas! Oh my word…I just LOVE the new RMHC set – Sprinkled with Love. Okay…I REALLY love the coordinating punch! A TREE!!! We got a TREE punch! I’m SO happy! I had such a fun time making these trees! It does take a little patience with all the little pieces but I think it is worth worth it. You have to be friends with your Tombow Glue to make this work. Whisper White – 3 5/8 x 3 5/8, layer onto Tip Top Taupe 3 3/4 x 3 3/4, stamp greeting using Tip Top Taupe and add to card front using using dimensionals. Trees – Tip Top Taupe (trunk), Cucumber Crush (solid top of tree), Garden Green (individual leaves) Watermelon Wonder (small flowers), Cherry on Top print (individual leaves and ‘ground’). 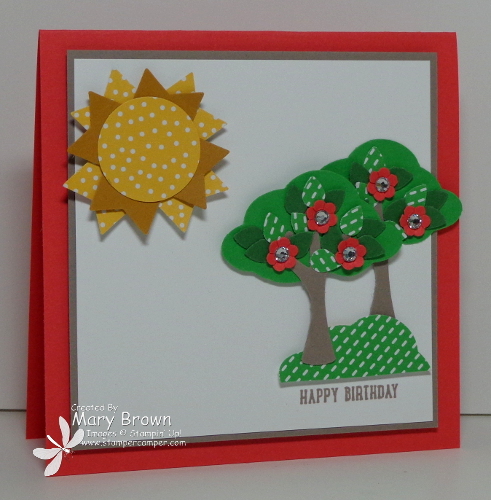 Add the bottom one right on the card, add the ‘ground’ then add the tree on top. So…take pretty much all the same things and make it 3D. 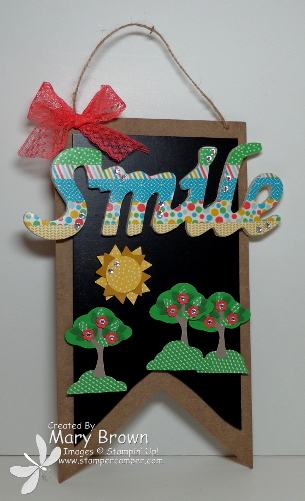 I found this chalk banner at Michael’s along with the SMILE would piece and thought it would make a fun wallhanging. The only thing that is really different is the ‘smile’ on top. I started by covering in white craft ink and drying (wanted it white and not wood). Next, starting at the bottom lay on strips of the Cherry on Top Washi Tape. Once you have that done, turn it over on a cutting pad and using an exacto knife, cut off the excess. That’s all there is to that and such a GREAT look! 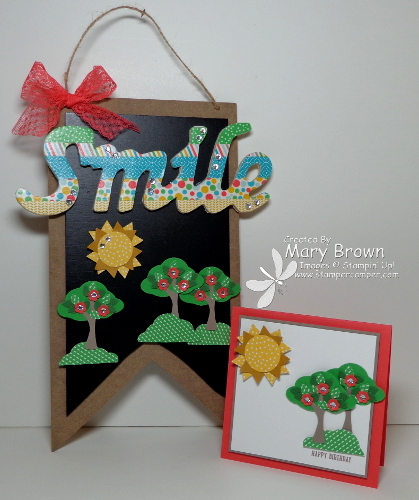 So the sun is the same as above (only added some basic rhinestones), 3 trees instead of two, the smile wood piece and then add a Watermelon Wonder 1″ Dotted Lace Trim bow to the top. Now it’s time to head over to LeeAnn Greff’s Flowerbug blog. I always just love her projects! This entry was posted in 3D, Tour de Freaks and tagged Sprinkled with Love. Bookmark the permalink. Your tree projects are wonderful and fun! You are so darn clever! !